Once you experience the powerful and resonaning magnetic energy field that attracts the Twin Flames together, one's life will never be quite the same again. There is a harmonious flow of unconditional love that is apparent from the very beginning of this connection. 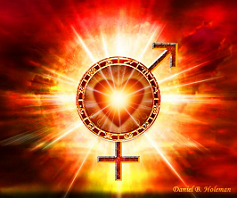 After experiencing a conscious reunion with the Twin Flame, the connection becomes the triad again that involves the Creative Source which flows through the Twinflame connection. The Twin flames are have always been connected to each other, and united with each other they are as One, and it is the two-as-one which is connected to God Source. 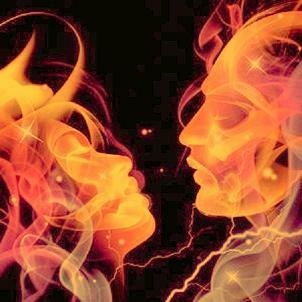 Twin Flame love at its very core is not merely human love, it is Divine Love that is using two human portals to channel that love and higher light onto a planet that seems to have lost its way and is stumbling unconscious in the darkness. Two humans totally united in love and service to ALL through the Will of the Creator/God/Source. How can you find your Twin Flame partner? First of all, it is not required that we look for our twin flame in the traditional way that we would go out to seek a physical partner for a relationship. We must not hold onto pre-conceived ideas or notions about how the Twin Flame should appear in our lives or how they will present themselves when the moment is right. When each individual Twin Flame has achieved the same level of balance within themselves (the balance of the masculine and feminine energies) then both twinflames will resonate to the identical vibration of Christ Consciousness or Unified energy. Once this happens the Twin Flame may automatically appear in your life and often when you are least expecting it. Often this occurs after a personal transition in your life and there are often many synchronicities leading up to and surrounding the TwinFlames physical meeting.